Like publishing ideas in books or newspapers, demonstrating in the streets has been one of the fundamental outlets for speech throughout our nation’s history. The Supreme Court has long held that speech gets maximum protection in certain kinds of public places, like parks, sidewalks, and streets. People with soapboxes need somewhere to put them, after all. In these public places, speech may be limited only for narrow and very specific reasons. States are allowed, for example, to prohibit demonstrators from blocking access to buildings like hospitals or fire stations. We allow the government to make and enforce laws designed to keep those vital public services operating, even when it might limit people’s right to demonstrate in certain areas. Courts call these “time, place, and manner restrictions,” and as long as they meet certain criteria, they’re constitutional. The one cardinal rule that these laws must obey, however, is that they can’t be applied based on the demonstrators’ message. It is never permissible for the government to keep people from expressing their ideas just because the government doesn’t like those ideas. The City of Seattle has a parade ordinance that ran into trouble on this account not too long ago. The law requires people to apply for a parade permit if they want to have any kind of demonstration that will interrupt the flow of traffic on city streets. In the name of keeping drivers and pedestrians safe, making sure that emergency vehicles can move throughout the city, and the like, the city is allowed to place reasonable conditions on when, where, and how people are allowed to march through the streets. Today, the parade ordinance has safeguards built in to make sure that it doesn’t violate people’s First Amendment right to demonstrate in public. Until an ACLU lawsuit, however, that wasn’t the case. 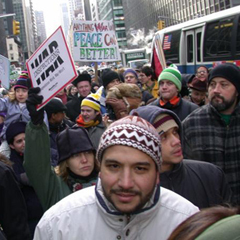 In 2003, a group called the October 22nd Coalition applied for and received a permit for a march through part of downtown. On the day of the march, Seattle Police told the gathered marchers that their permit had been rescinded because too few marchers had showed up to justify closing down the streets. The permit hadn’t specified that any particular number of marchers had to be present for it to be valid, but the law in effect at the time gave police the authority to revoke it essentially for any reason they wanted, without having to explain themselves either before or after the fact. Deprived of their permit, the marchers had to stick to the sidewalks and wait for all of the traffic lights as normal pedestrians. They ended up split up into small groups and weren’t able to stage an effective demonstration—precisely what they intended to avoid by applying for the parade permit. The police response was especially troubling because of the mission of the group seeking to march. The October 22nd Coalition is dedicated to protesting police brutality. The parade organizers had applied for and received a valid parade permit, then showed up expecting to stage a public demonstration against police brutality, only to discover that the police had suddenly decided not to honor the permit. The law that allowed police to do that was unconstitutional, and the ACLU of Washington knew it. We sued the city on behalf of the Coalition in 2004, and in 2008 a federal court of appeals agreed that, in allowing police unfettered control over parade permits, the law violated the First Amendment. We then went to work with the City to help craft an ordinance that included proper protections for the rights of demonstrators. The revised law went into effect at the end of 2008. These kinds of speech issues crop up over and over again, but sometimes cities do the right thing right from the get-go. This week, the City of Vancouver approved a special-events ordinance that protects demonstrations like the one that led to our lawsuit against Seattle by exempting them from having to obtain a permit at all. Instead, the Vancouver ordinance gives demonstrators an official method for voluntarily notifying the city of their plans so that they can work together to ensure safe and successful exercises of First Amendment rights. Vancouver should be proud of its new ordinance, and we hope that other cities will follow its lead.